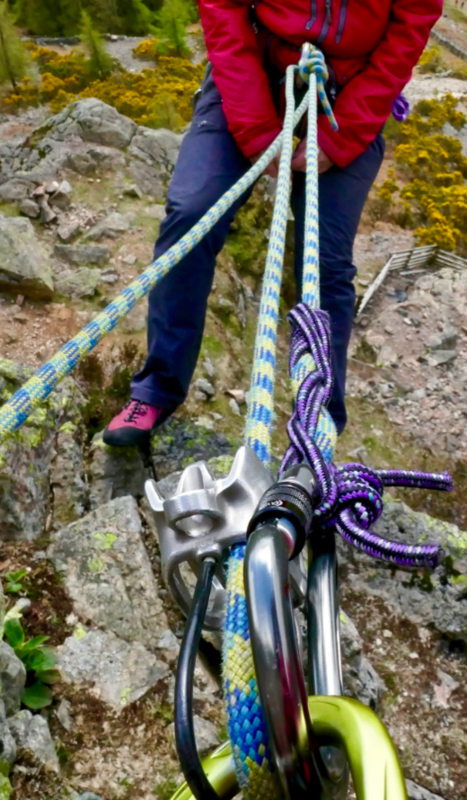 We spend a lot of time passing on new skills to our clients, this could be anything from how to read a map to leading a trad rock climbing route. This covers a lot of skills and information, so we need to also be keeping on top of this and always want to be learning new things so we can pass on new skills and latest developments to you. This last couple of days we have attended two different courses, both focused on teaching mountain based skills. 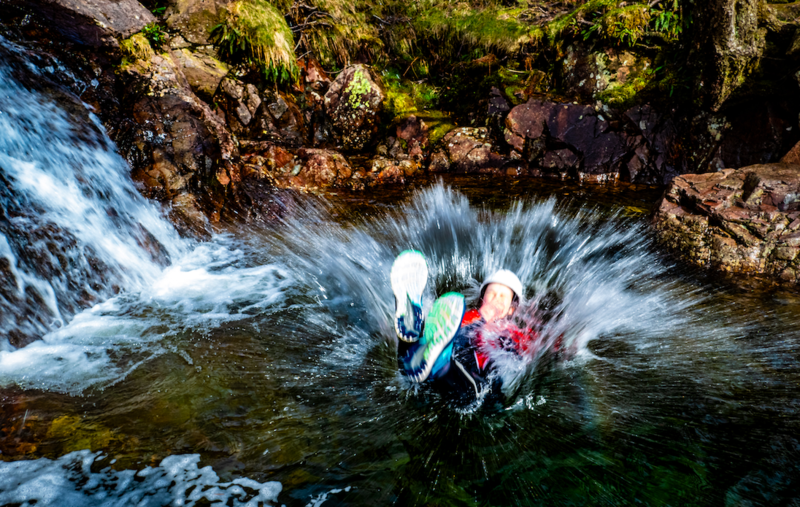 Firstly a 'Teaching scrambling' day. 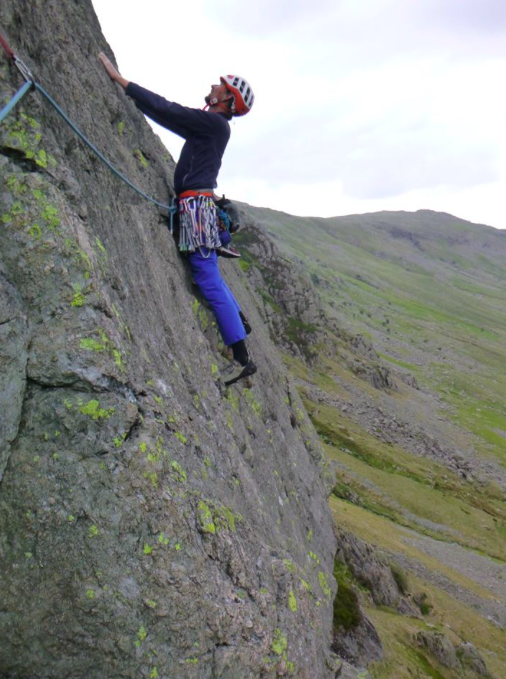 For this we used White Ghyll Edge and Tarn crag in ascent and descent. As a group of 5 we talked through movement skills and coaching, when and where spotting can be appropriate, route choice and route finding skills. We later considered when would be appropriate to deploy a rope and how best to use it / show it's uses in an easy to remember format. This was an incredibly useful day, with lots of ideas shared. A real take-home improvement for me is the introduction of a clove hitch when taking coils. This brings a great improvement in stability when attached to anchors. Day two was focused on 'Teaching self rescue skills'. Not something we are asked to do very often and an area many become rusty in, as thankfully these are skills we don't use much. 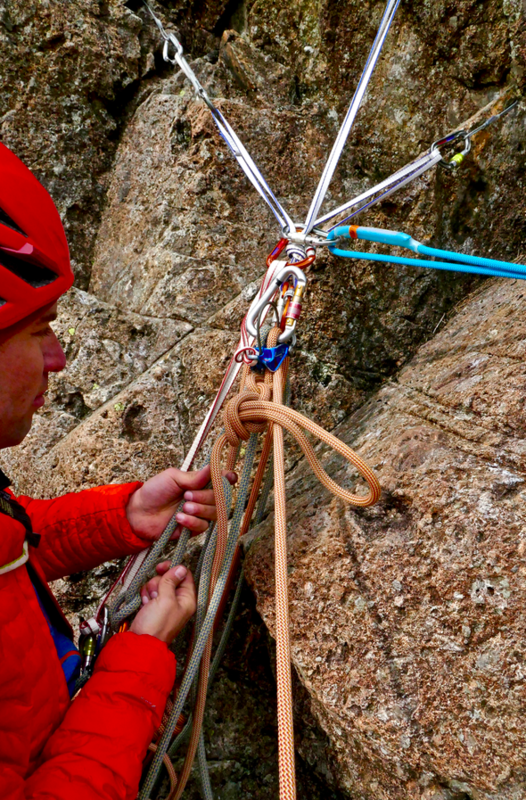 It was very useful to simply watch someone else explain all the basics, starting with tying off a belay device and attaching a prussic. Setting up an assisted and unassisted hoist, all whilst 'in the system'. 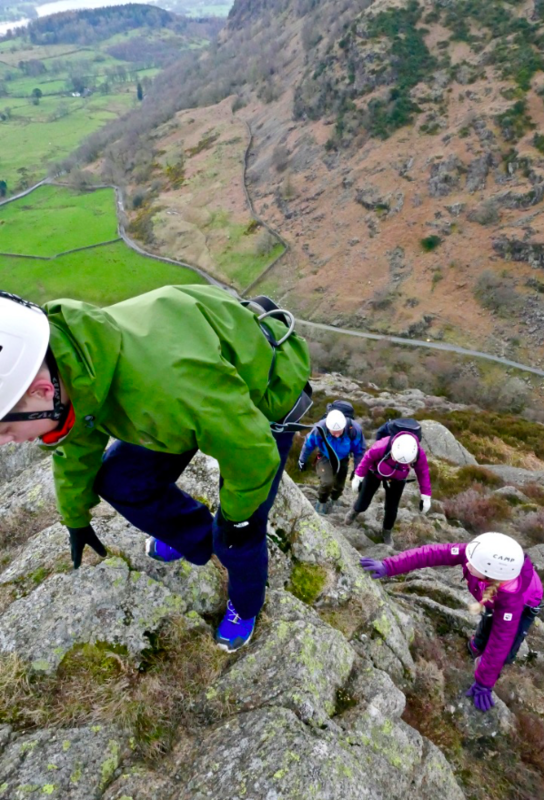 We then went climbing at Upper Scout crags in Langdale and worked through a number of 'scenarios' whilst climbing. Again, it was really useful to share ideas and look at how others approach problem avoidance and problem solving. An important theme that ran through the day was very much 'problem avoidance' as this is so much better than looking for solutions! We managed a couple of multi-pitch routes before the icy wind chilled us all and we ran back to the valley floor. Two brilliant days, very well delivered by Nick Canon Jones, thanks Nick. 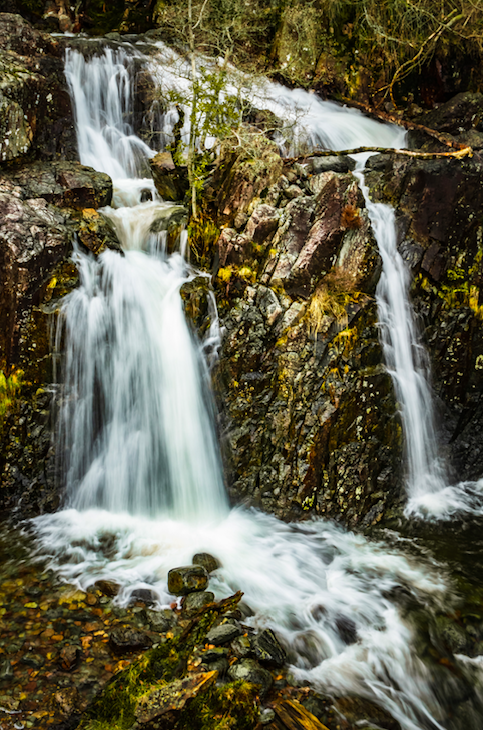 As well as days spent on the crags and in the fells, we've been lucky enough to spend time in the gorges too. 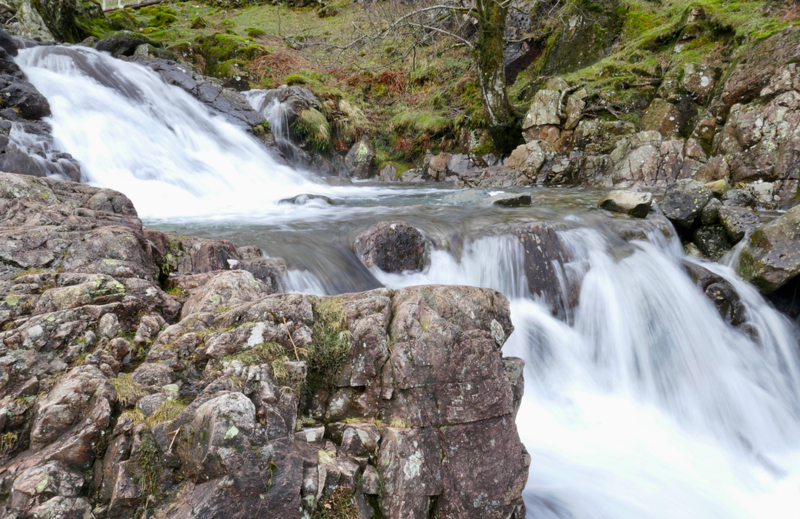 Over the last week we've been in Stickle Ghyll, Church Beck, and Hause Ghyll. A little apprehensive about a dip in Church Beck due to the chilly days of late, but all was well once in there. 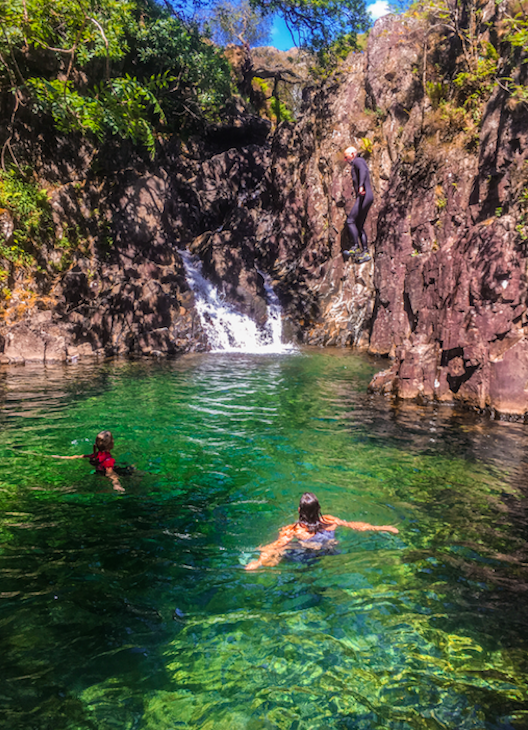 Take time to get wet rather than jump straight in and the body acclimatises and the cool waters feel refreshing. 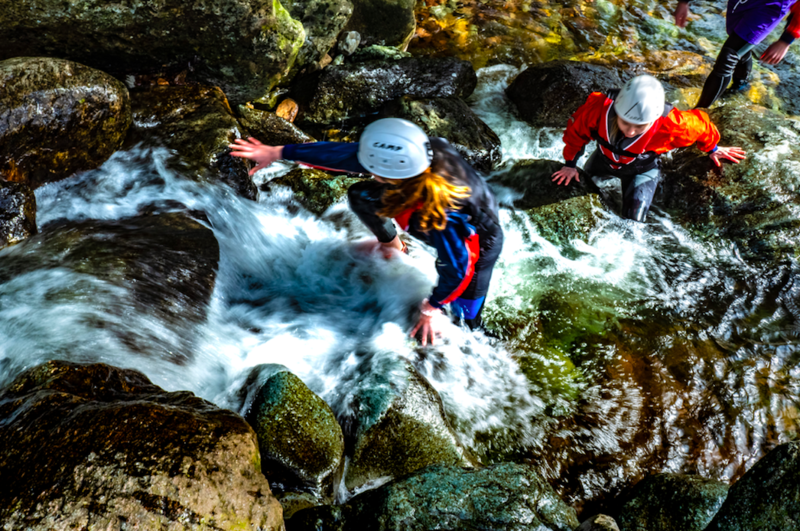 We scrambling, bouldered, climbed, jumped, and slide our way through the many challenges in this fantastic gorge. There's also been two visits to Hause Ghyll in the Borrowdale valley. 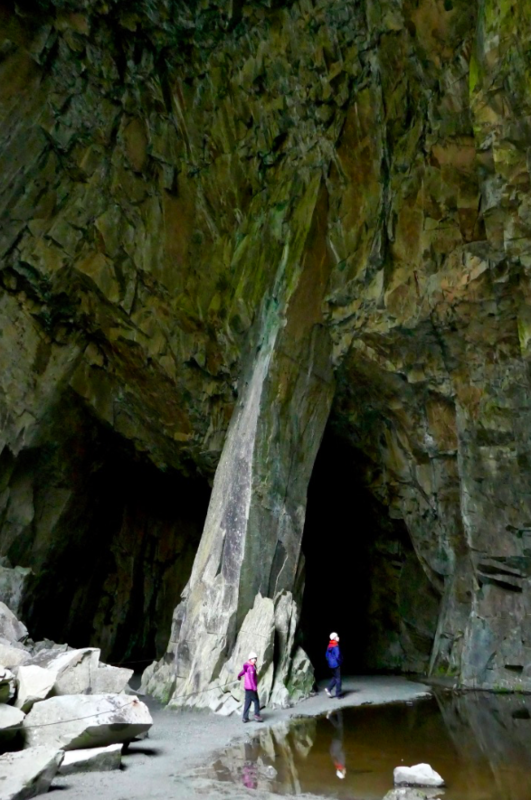 Not a regular venue for us, but certainly a venue we'll add to our list of Borrowdale activity locations. A perfect gorge for families with kids to entertain. 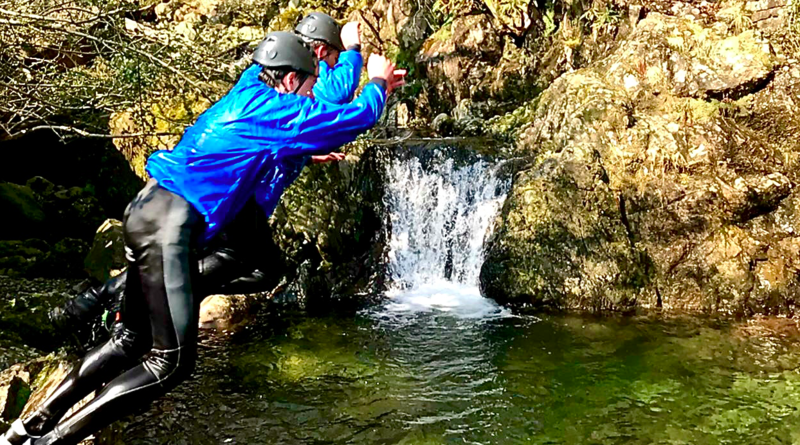 Our first visit was to get reacquainted with it and we had the experience and knowledge of Iain, another local and highly experienced instructor, to help show me and Hayley all the fun challenges and all the things to watch out for. This was a fun couple of hours and very worthwhile, professional development is so important and we value it highly. 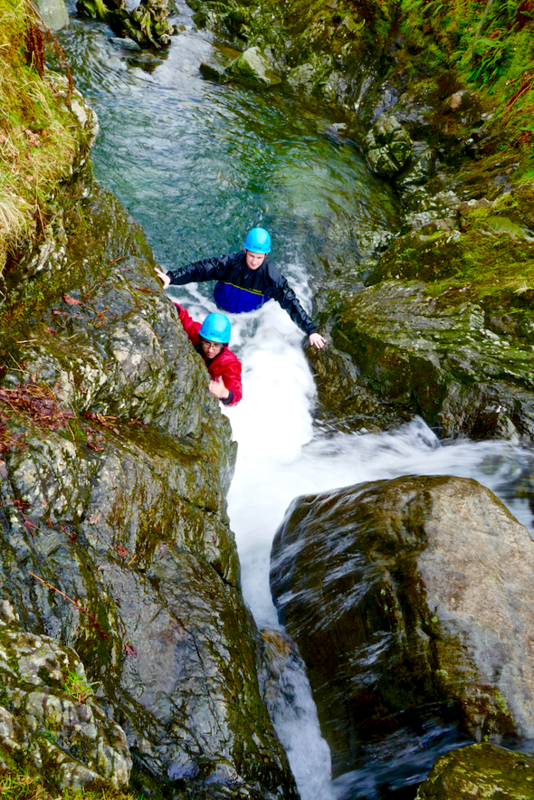 And today it was back in Hause Ghyll, this time working for Iain, with a group of graduate trainees on a team-building session. 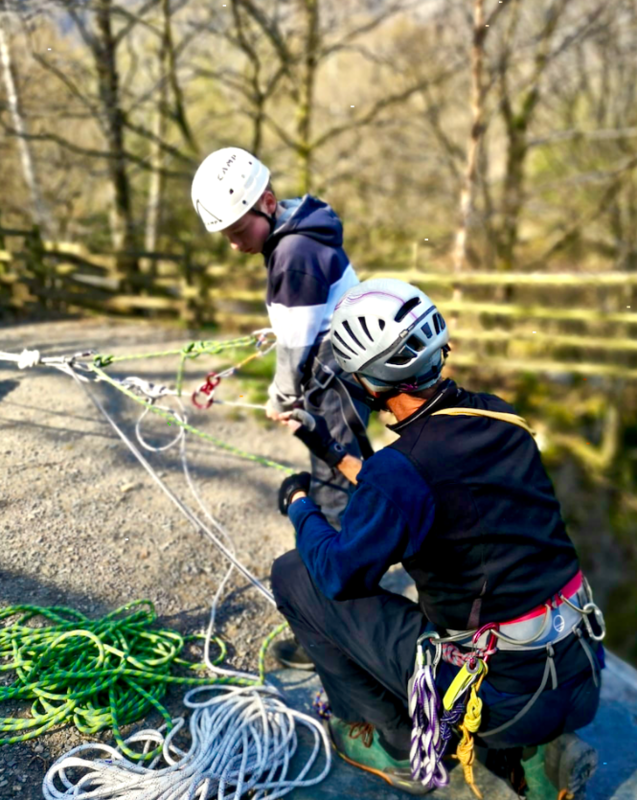 With us facilitating the group were able to safely help each other and work through the various challenges together, hopefully strengthening their relationships and building new friendships amongst the group. It was a cold day, with snow on the mountains, and this was an additional challenge as we all needed to look out for each other to keep a check on body temperatures. Great times, here's looking forward to many more weeks like this. Thanks to Sarah, Iain, Hayley, and all of todays team. About to go for a swim! 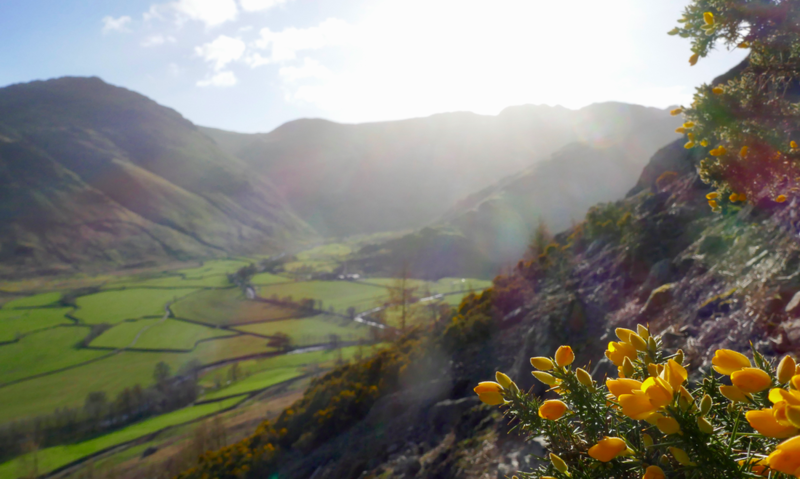 As is often the case during springtime here in the Lakes, there's been a spell of magnificent weather. Cool, fairly calm, and sunny almost every day. When the skies are clear and the temps are just nudging into double figures there honestly is nowhere on the planet I'd rather be than here in the Lake District. It is truly magical. Yes we are lucky to live and work here and most definitely cherish this. Being able to share the best of the Lakes with our guests and fellow outdoor lovers is an absolute pleasure and privilege. 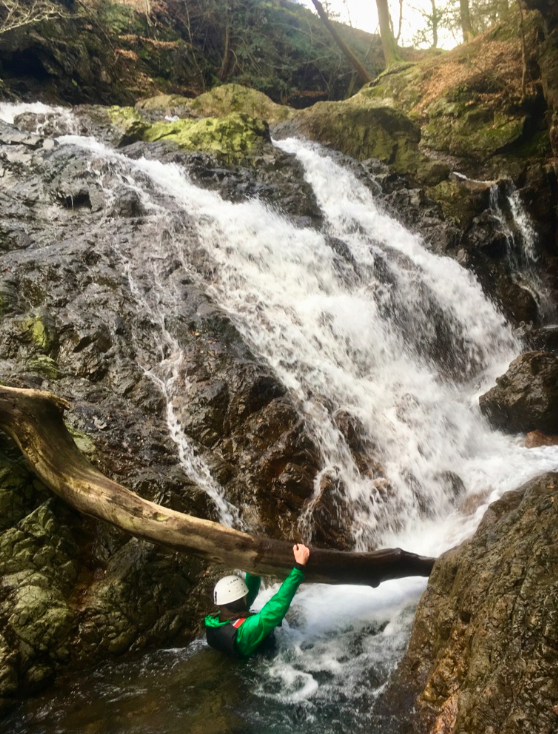 This week has been busy, a mix of refreshing venues after a winter spent abroad, and lots of folk to take out into the fells and onto the crags. 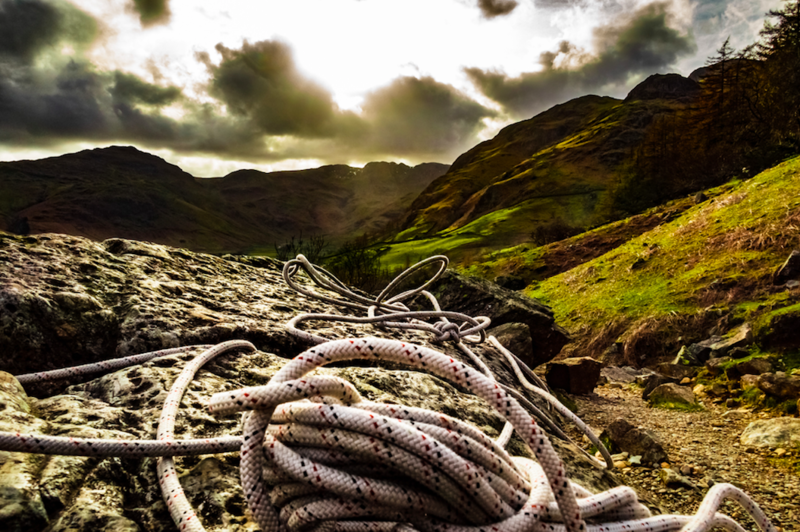 A visit to Raven crag in Langdale is also top of my list at this time of year. 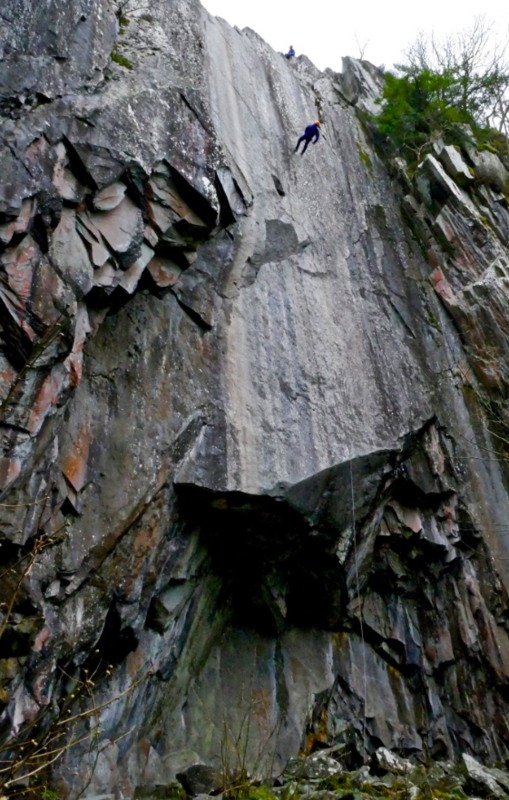 It's a valley crag, gets loads of sun, is quick drying, is easy to get to, and is packed with brilliant climbs. Me & Anna climbed Original route (S) which was great fun. 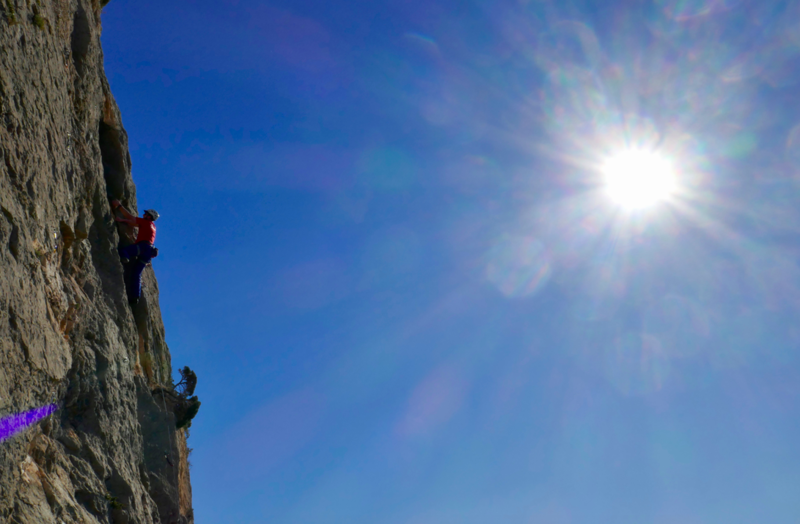 There were plenty of climbers out enjoying the Stella conditions too. I hadn't had chance to check out the descent route post rockfall, so today was a good opportunity to do so. The amount of rock to have fallen was bigger than I had expected, truly massive in fact! But thankfully the descent route has not really been altered at all, not technically anyway. 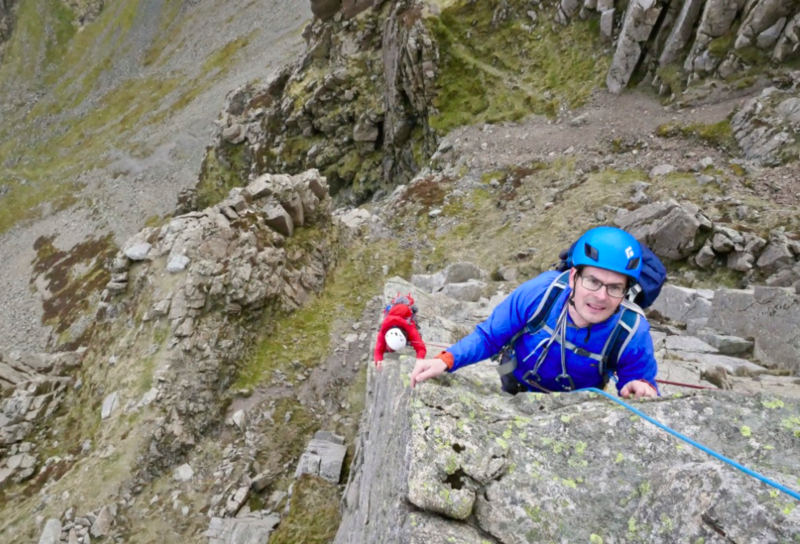 Another day out on the rock with fellow instructor Si saw us in Borrowdale and that other fine all year valley crag, Shepherds. 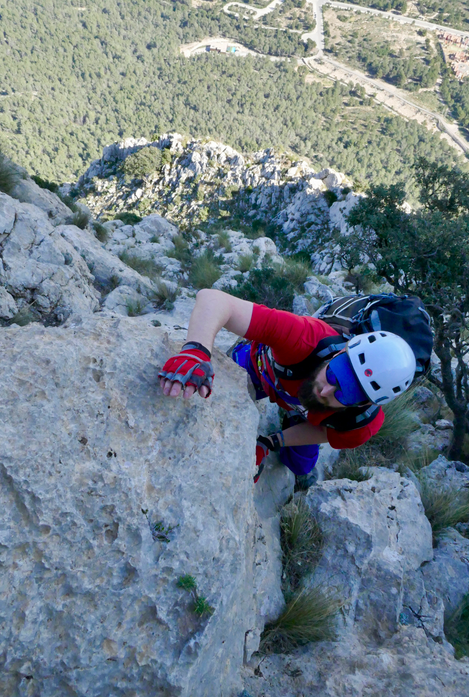 We cruised through 3 routes, starting with Chamonix (HS), then on to Little Chamonix (VD), and finishing off with Ant Highway (MVS). 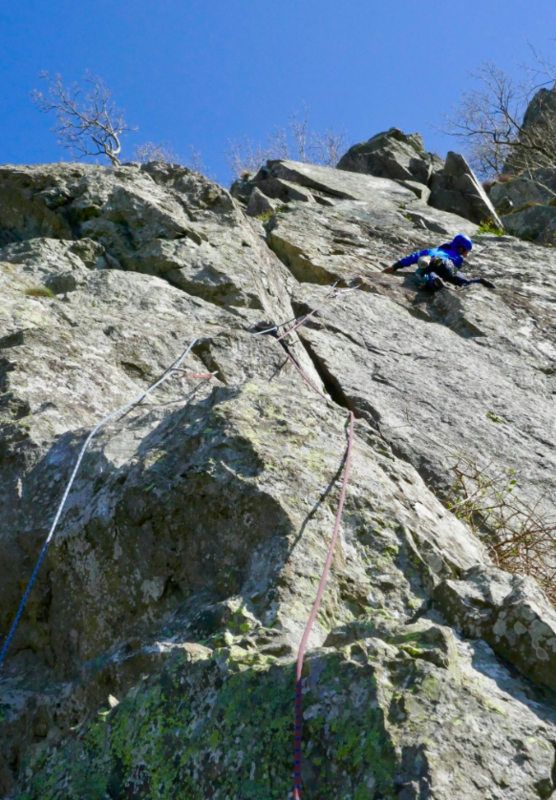 Whilst not a lot of climbing for an afternoon, the sun was starting to loose its power and chilly fingers were not too far away, so we called it a day, happy with the 3 good quality routes we'd climbed. Mixed in with all this rock action was a fab day of walking with Jason. It's been quite a few years now since getting out in the hills with Jason, so was really nice to catch up and show him an area of the Lakes that was new for him. The plan was Bowfell, but after a further chat on the drive into Langdale, a Langdale Pikes day was sounding far more likely and that's what we opted for. 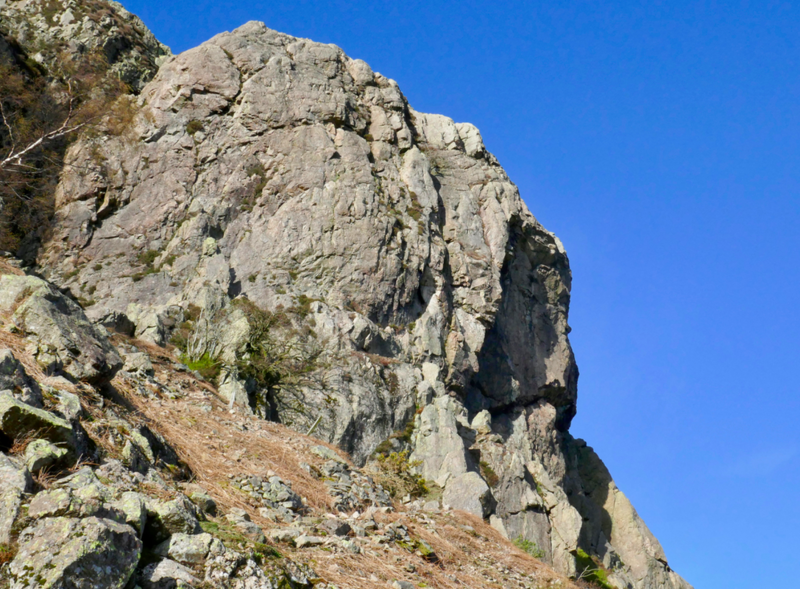 Up to Stickle tarn then onto the summit of Harrison Stickle for magnificent views far and wide. We descended via Thorn crag and the Dungeon Ghyll. A chilly but clear day made for sublime walking conditions, how lucky were we, ace. No Lambs out on the Langdale fells yet, but not going to be long. It's been a really busy few days here in the Lakes, helped by sunny weather no doubt. At the weekend we welcomed a family of 7 here on a short visit. 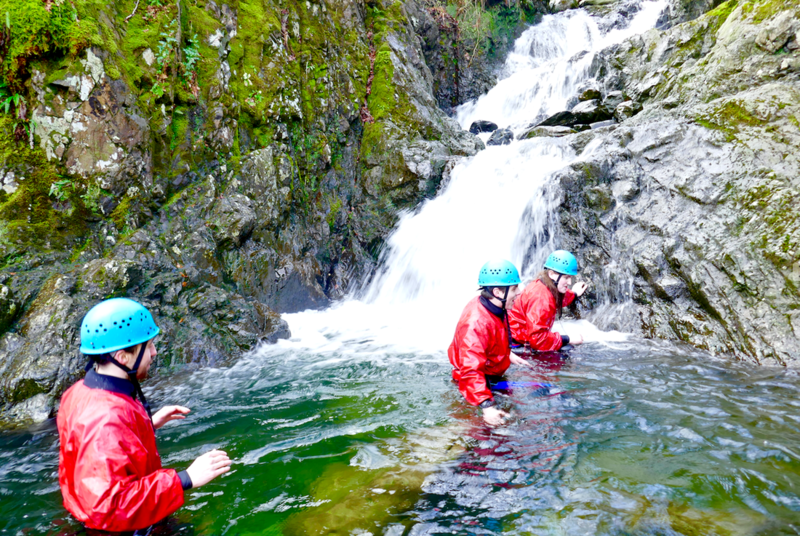 All were keen to experience Ghyll Scrambling so that's how the day began. To say this family embraced the water would be an understatement, all were swimming within a few minutes and this theme continued, with jumps and swims aplenty. Everyone managed about 4 routes, these getting progressively more difficult to add to the challenge. Eventually we were all pretty tired from so much activity. Sun was coming low in the sky and giving a gorgeous light to the valley. We called it a day and headed home, after another cracking day out in this amazing valley. Big thanks to Jessica for organising the day with us, hope to see you all again soon. 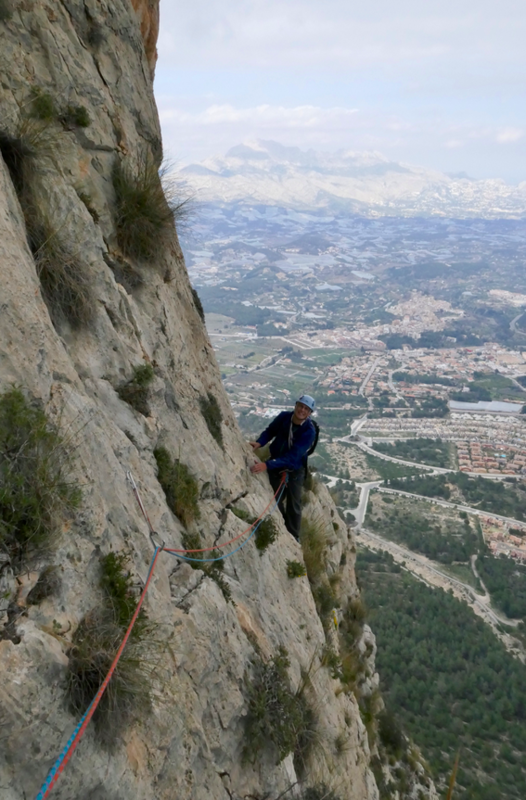 After 5 months over in Costa Blanca it felt a bit odd to go out into the hills on a wet and windy day. But it took only a few minutes to remember that venturing out in the rain is not only normal, but can be fun and satisfying. The landscape is transformed and has so much more colour during and after rain. 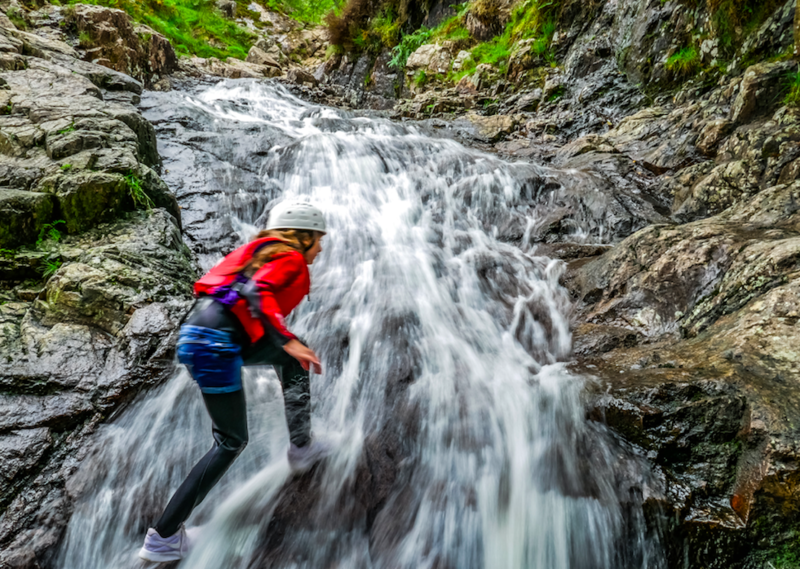 Our first choice wouldn't be to go rock climbing on such a day, but there's plenty more to the Lake District than the climbing. Starting with a nice gentle walk along our favourite valley, Langdale. 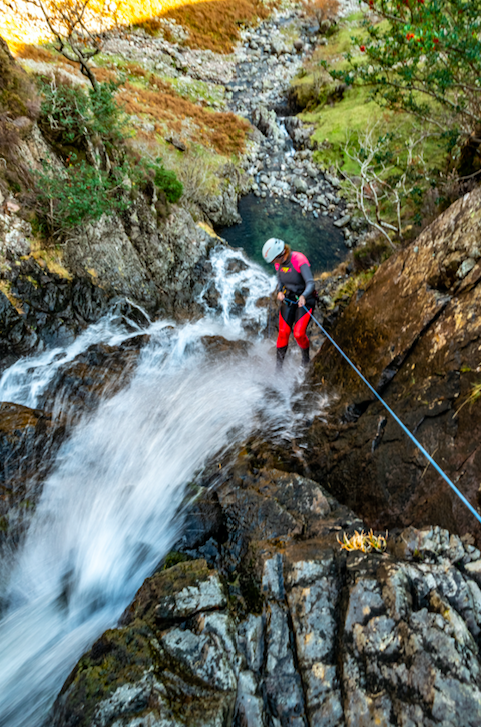 Revisiting Stickle Ghyll, our most popular Gorge Scrambling venue and watching the water cascade over the rocks and into plunge pools, absolutely mesmerising. 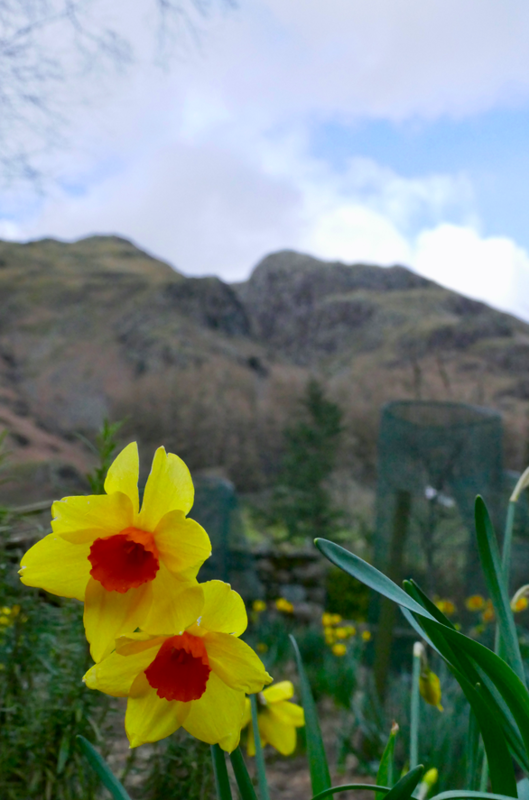 Daffodils are starting to flower in the valleys, adding an extra splash of colour, all helping us to forget the sky may be a bit cloudy! Today I was joined by my pal Sam, and we enjoyed a wet & windy run around Loughrigg. 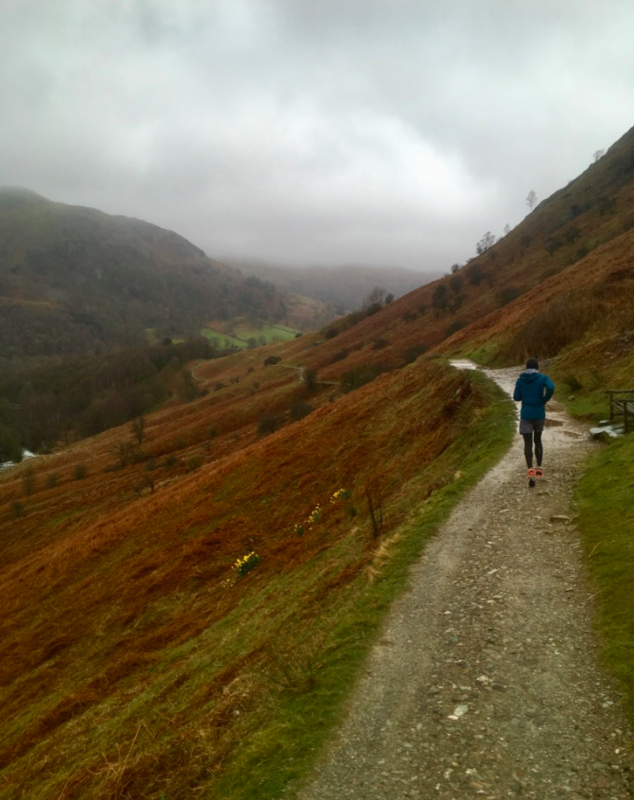 A lovely route that makes for a good introduction to Fell running or simply to be enjoyed as a leisurely stroll to take in the many fine views of the Coniston, Langdale, and Fairfield ranges, as well as the tarns of Loughrigg, Grasmere, and Rydal. The route is relatively flat too, for the Lakes! 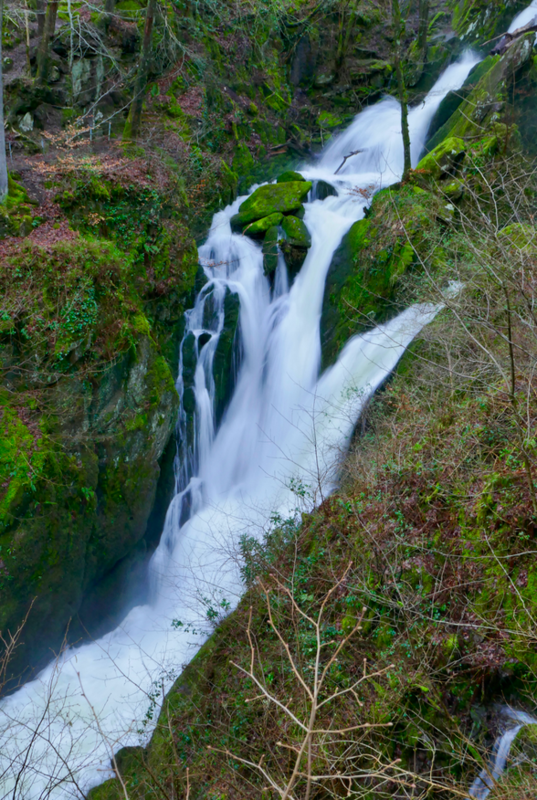 With a big downpour again this afternoon we couldn't resist a stroll alongside Stockghyll Falls, Ambleside. These were in full spate and absolutely raging down the mountain, quite a spectacle. All of these have been hugely enjoyed and we can wholeheartedly recommend any as a rainy day activity. It's been another amazing week out here on the Costa Blanca, with temperatures rising very nicely and unbroken sun everyday. We've had a full house, with Tom & Astrid, Sarah & Paul all focusing on mountain running during their stay and for Sarah winning a big race locally - top effort! 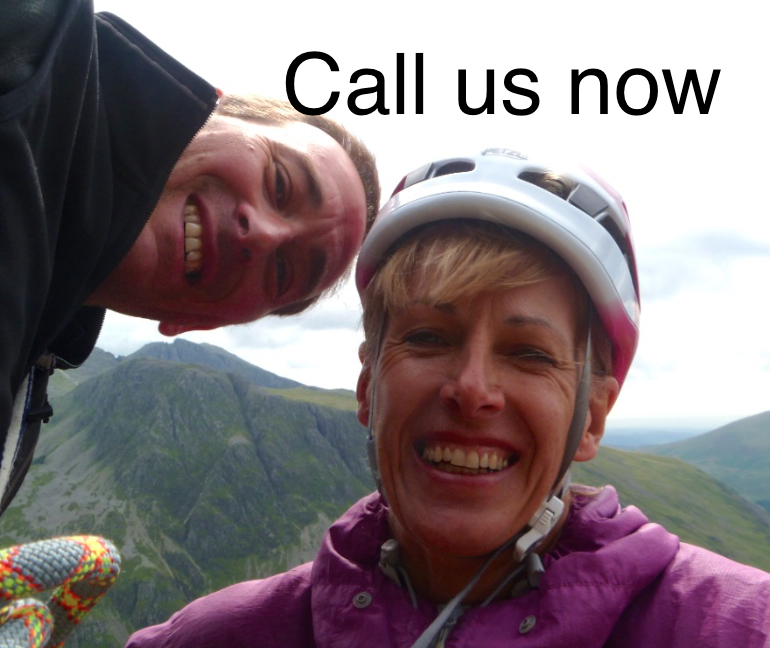 Whilst Jo & Steve have been out climbing with me most days. 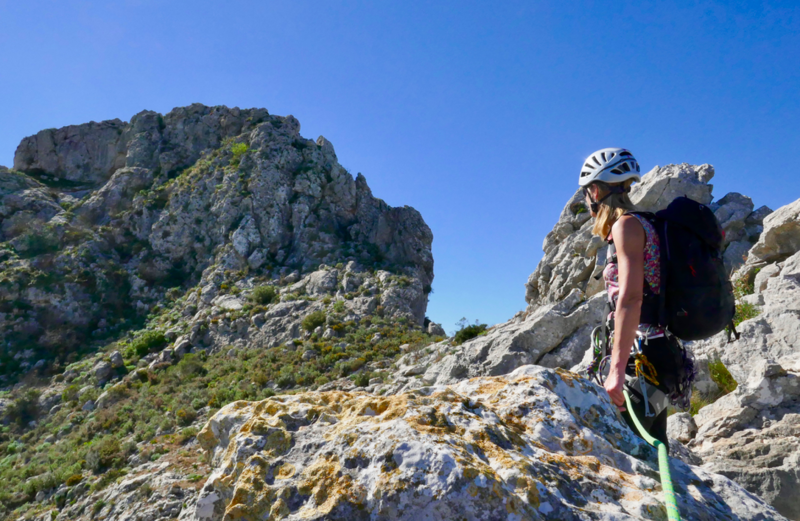 After our mountaineering day on the Ponoch, we followed with a more leisurely day of cragging at Cabezon d'Oro. It was good to be focusing solely on climbing and clipping bolts. 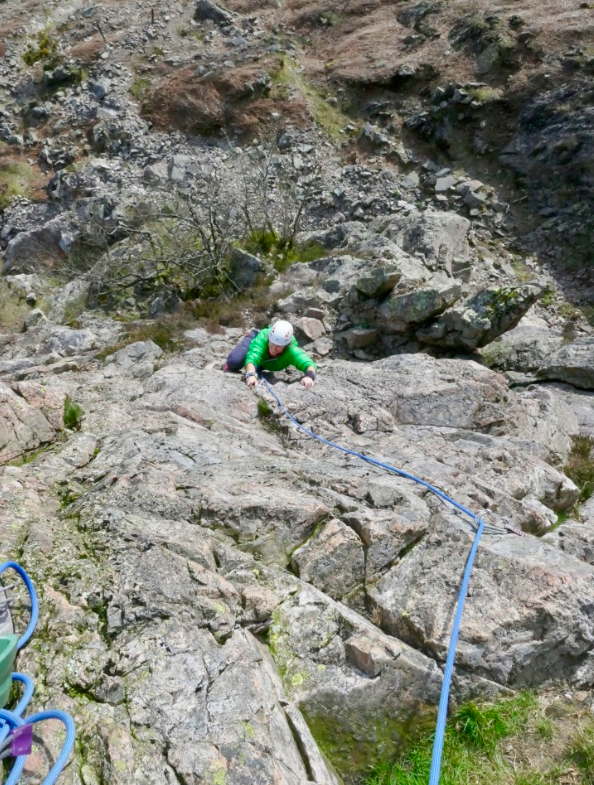 And for Tuesday it was more cragging. 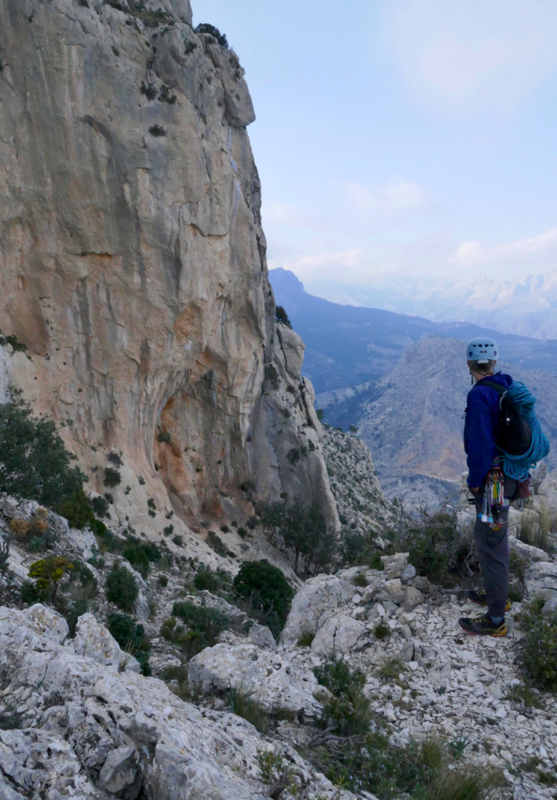 This time at the ever popular Sierra de Toix near Calpe. I think it was 6 routes led for Jo & Steve, nice one. Wednesday took us back to the mountains, after all these two are adventures first, bolt clippers second. 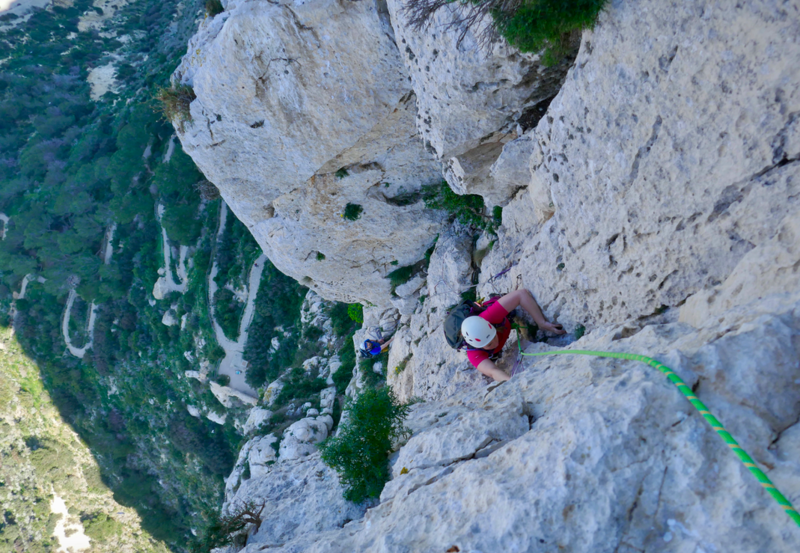 Surely the best way to be.The long and weaving ridge climb of 'Arista al Forat de la Forada' goes at about UK Severe standard and provides loads of great climbing in a beautiful setting. 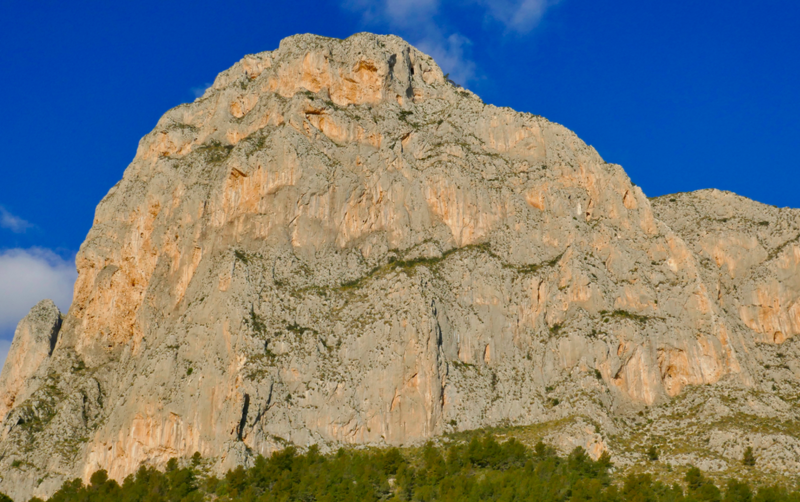 To finish there is an abseil through the large forat (whole in the rock) which always proves to be a winner. 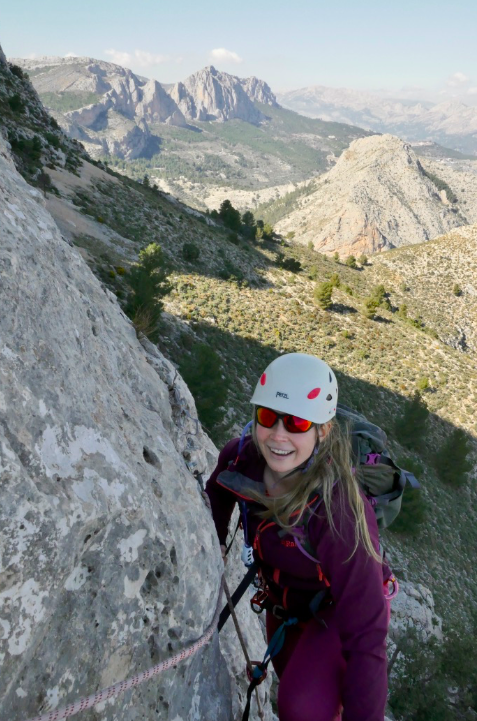 On Thursday Jo & Steve headed out to the nearby Alcalali crag, whilst me & Kate also enjoyed a day of sport climbing at Las Cerrezas crag near Tarbena. By now the weather has become really really warm!!! 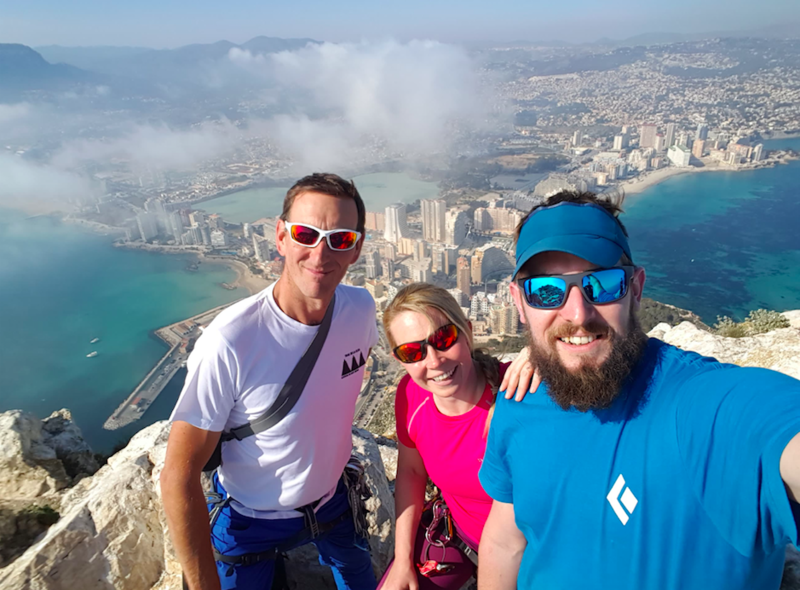 Friday arrives and after a good and productive day of climbing for Jo & Steve we decided to round the week off with a climb on the iconic El Peñon d'Ifach that dominates any view in the Calpe area. 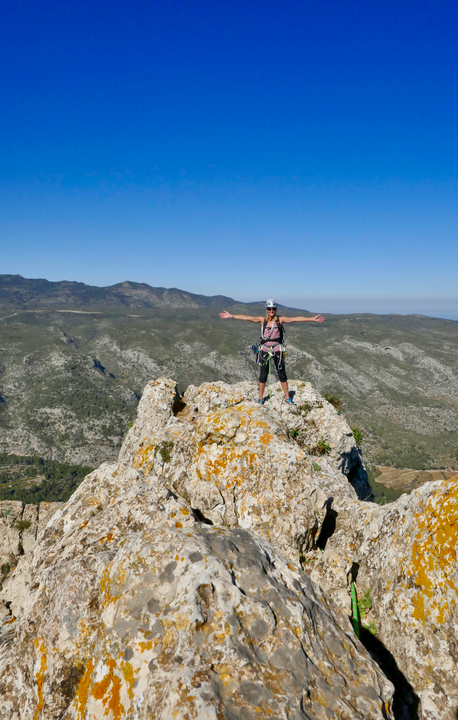 The warm weather made the north face simply perfect for climbing and we enjoyed 7 glorious pitches of VS climbing taking us right up to the summit trig point. And of course, Friday night here in La Llosa de Camacho wouldn't be complete without a trip to Bar Emilio and tonight we were a table of almost 20 celebrating Rachels 25th Birthday. Wow, what a night. Much food, more drinking, and even more dancing. After a week of climbing and adventuring it's just what we all needed. 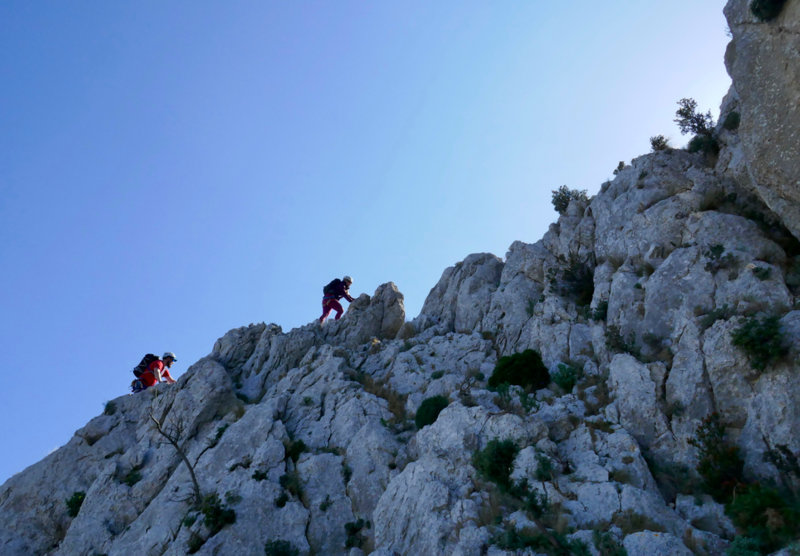 Big thanks to all who joined us this week and to everyone who joined us this winter here in Costa Blanca. Kate returns to the UK on Tuesday and I'll be just a few days behind her. It's been an incredibly good winter, with almost constant sunshine from early November. We've had the pleasure of welcoming and climbing so many people yet again this year and we thank you all wholeheartedly. Looking forward to see many of you in the Lake District over the summer and again this coming autumn back in sunny Costa Blanca. Sometimes a snooze in the order of the day. 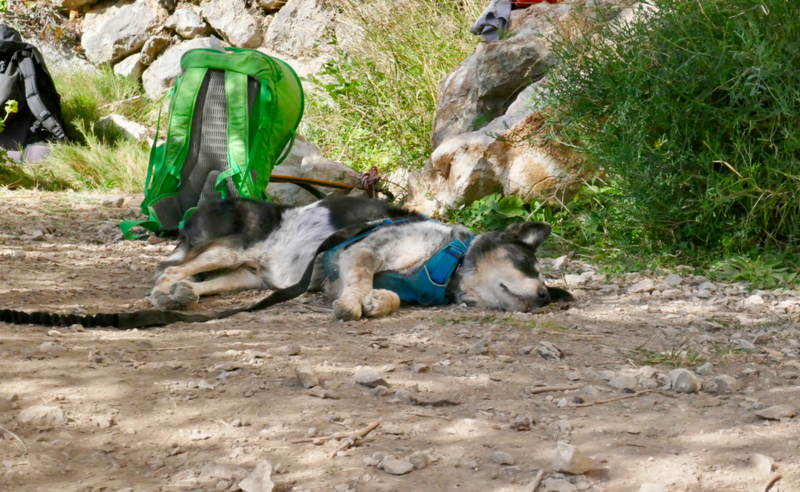 Don is an expert snoozer when at the crag!